A year and a half after the release of the monumental Cities, Anberlin is back, backed by a new record label, and are eager to introduce you to New Surrender. The release of their compilation project, Lost Songs, in November 2007 marked the end of their contract with Tooth and Nail Records- the band's label home since the early days of Blueprints For The Black Market. Now, they are partnered with Universal Republic, and their evolution is evident. 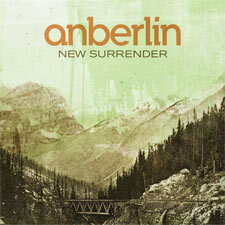 New Surrender initially doesn't seem to reflect the "Anberlin" sound fans have come to know throughout their past three albums. However, that doesn't mean the quality of this music is anything less than what they would consider their best. Every song on this album has a beautiful story to tell. The opener, "The Resistance," is one of the more solid rock songs found on the album and serves as a really great introduction to the album. "Breaking," formally known as "Bittersweet Memory," follows. Our first glance of this song was through the acoustic videos and the digital download package that was available at Warped Tour. It was promising as an acoustic alone, and in this electric format, it doesn't fail to deliver. "Blame Me Blame Me" is a very up-beat tune reminiscent of "A Day Late." The chorus sings, "Blame me, blame me, blame me for mistakes you make but you can't own. Hate me, hate me, hate me for every honest word that you postpone. Leave me out of this; lights on sinking ships are gleaming, gleaming, gleaming for mistakes you've made but you can't own." This is definitely a highlight of the album and is sure to stand out among fans. After "Blame Me Blame Me," the album takes a more mellow turn for "Retrace" - a sweet love song which displays Stephen's clearly matured vocals and, lyrically, his ability to create amazing imagery. Next up is the new, yet not completely improved, "Feel Good Drag." This song first made its debut on their sophomore album, Never Take Friendship Personal. At first listen, the song sounded drastically different. However, with each listen, the differences between the two seem to disappear. It still has its edge, even though they have discarded the screaming vocals. Lyrically, this song is all about angst and is really emotional. New Surrender's version doesn't seem to capture that intense emotion like you were able to hear and feel in NTFP's. At the half-way mark is "Disappear"- the first song we were officially introduced to by the band in mid-July. It speaks of the homeless and the neglected, and out of the whole record, it sounds the most like the Anberlin we know. It is one of the most memorable tracks, by far, especially with its unique subject matter. "Breathe" is a light, romantic song. It is simplistic in structure, but completely fits the tone and direction of the song. "Burn Out Brighter," "Younglife," and "Haight Street" are all less memorable than those previously mentioned. However, they are pleasant and tend to reminisce on care-free days and one's youth. "Soft Skeletons" is a beautiful song about a girl who doesn't seem to have the strength to carry on a fight against pain and addiction. Stephen's vocals are spot-on, sounding almost like melodic whines and cries, as he sings, "I just wish that I could heal all the hurt you feel tonight. There's life in your veins. These needles are chains to hold you down. How can you expect to win this war when you're too afraid to fight?" It's become a tradition for Anberlin to close their albums with an epic, exceptionally prolonged, finale. New Surrender's "Miserabile Visu" is no different. Though it lacks the intensity of "*Fin," its beauty seems to test the boundaries of eternity with intimate vocals and electric guitars. The overall quality of the songs is very strong and demanding. This is a new chapter for the band, and while there are obviously still elements of the old Anberlin, the new ones will undoubtedly have a powerful reign. Some might notice vast differences; some might think they are pretty subtle. These changes could be their evolution or, simply, Universal Republic's generic influence on them, unlike Tooth And Nail's indie fashion. Musically, it seems they were more conservative with this debut on Universal. It is evident the immense talent they've portrayed in the past isn't completely made known. A lot more keys are involved, hence the addition of a new keyboard player from the late band Acceptance. Stephen Christian's voice improves more and more with each album. This was most evident with the release of the acoustic videos of "Breaking." Yes, this album might be more produced than the past ones, but when you hear him all stripped down, he still has a very powerful, smooth voice that demonstrates his remarkable abilities. The lyrical quality has also seemed to have improved tremendously. As a whole, it definitely deals with similar themes found throughout their previous albums, just in new approaches. "Miserabile Visu" is a lyrical highlight, and the growth in Stephen's writing is very noticeable. The amount of spirituality seems to decrease with each album, however, two songs highlight this theme to a very respectful level. "Burn Out Brighter" deals with wanting to live your life not for yourself, but for "something higher than myself." Also, the closer, "Miserabile Visu," is filled with spiritual references from Revelation - from mentioning the antichrist, to the mark of the beast, and even the second coming of Jesus through beautiful symbolism and an intense amount of detail. Much respect is deserved and given to Anberlin for making the always-risky move to a major record company to further their music career and, ultimately, reach and move larger audiences with their music. This was the tell tale sign if they could stand up with major record labels and still maintain their integrity. Through the differences you will find, you will see these changes are not necessarily negative. At the heart of this album, you know it's still Anberlin. And I think that says a lot about their dedication to their fans and the integrity of their music.